Computing perimeters, areas, and arc lengths of sectors using formulas. 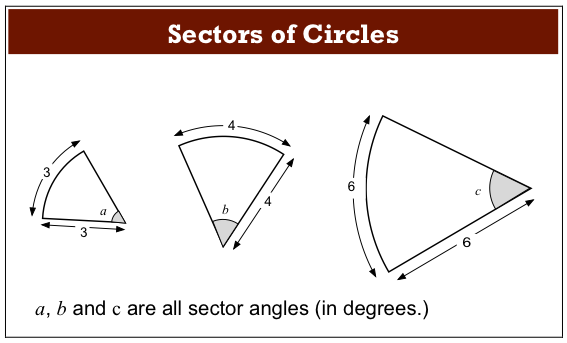 Finding the relationships between arc lengths, and areas of sectors after scaling. Before the lesson, students work individually on an assessment task that is designed to reveal their current understanding and difficulties. You then review their solutions and create questions for students to consider, in order to improve their work. During the lesson, small groups work on a collaborative task matching cards according to the arc length, area, or perimeter of the sectors. After considering in the same small groups the general results of changing the radius and/or sector angle of a sector, there is a whole-class discussion. In a follow-up lesson, students review their initial solutions and then use what they have learned to either revise the same introductory assessment task or complete a different task. Each student will need a copy of Sectors of Circles and Sectors of Circles (revisited), the Circles sheet, a mini-whiteboard, pen, and eraser. Each small group of students will need a glue stick, an enlarged copy of Arc Lengths and Areas of Sectors, and the cut-up cards Dominos 1, Dominos 2, and Changing the Angle and Radius of a Sector. There is a projector resource to support whole-class discussions. The Card Sets may also be copied onto overhead transparencies to support these discussions. 20 minutes before the lesson, a 100-minute lesson (or two shorter lessons), and 20 minutes in a follow-up lesson. Timings are approximate and will depend on the needs of the class.